The 3-required skills for covered call writing and selling cash secured puts are stock selection, option selection and position management. We can also add timing of our trades as a secondary factor in enhancing our overall returns. These considerations are different for option-selling compared to traditional buy-and-sell portfolios. This article will highlight how and why to take advantage of the best times to trade to maximize our option-selling profits. The red line shows how time value is lost later in a 1-month contract for our near-the-money strikes. Each day, there is frequently early morning and late afternoon volatility. This is related to a reaction to after-hours news, computerized institutional algorithmic trading and day traders closing positions. We want to avoid these hours so that we buy securities and sell options without extreme volatility moving one position from the other. In other words, we want to establish positions with the initial returns based on our option-chain analysis. Therefore, the best hours to establish our initial positions are between 11 AM ET and 3 PM ET. Exit strategy opportunities can present themselves at any time during an option contract. We must take advantage of these moments as soon as they appear. These trades can be automated. Option positions can be closed (buy-to-sell) by setting limit orders immediately after selling the option using the 20%/10% guidelines. If we sold an option for $2.00, immediately set a limit order to buy-to-close at $0.40 (20%) or less. Change the limit order to $0.20 (10%) mid-contract. If the thresholds are met, the trades will be executed automatically even when we are not in front of our computers. At that point with the short calls closed, we can make decisions pertaining to our next steps as detailed in my books and DVD programs. ***The above bullets are useful for “stock-only” portfolios and are not to be used for our option-selling strategies. Our option-selling trades are best entered between the hours of 11 AM ET and 3 PM ET early in the Monthly contract. Exit strategies should be implemented whenever those opportunities arise and a good deal of position management can be automated by entering limit orders after initial trade execution has been established. The BCI methodology is the simplest, most conservative and, with research provided, the most cost-effective way to “beat” the market. And you will. Thank you, Barry, your team and all the members who make this community the overwhelming value that it is. ***Market tone data is now located on page 1 of our premium member stock reports. I have read your encyclopedia for covered calls a few times and currently am a BCI premium member. I am 31 years old and currently reside in Suffolk County, NY. The info you have taught me has made me confident to handle my own investments going forward. It is going very well so far. Something I can’t find any info on in a negative time value – see example below. Is this a situation where an exit strategy should be implemented? I have seen it several times when the bid/ask spread inflated and the strike price becomes deep ITM. Thank you for sharing. Believe it or not – it ha changed my life greatly for the better. An in-the-money call option consists of intrinsic value + time value. 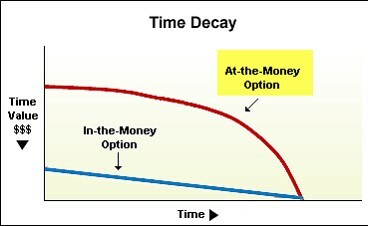 As the strike price moves deeper in-the-money (stock price moves up), the time value will approach zero. This is the basis of our “mid-contract unwind ” exit strategy. With NSP trading at $129.65 and the $125.00 strike priced at $4.70/ $6.70, we do have a positive time value component even when looking at the published bid price of $4.70. The $125.00 strike is $4.65 in-the-money and so the time value component is $0.05. If leveraging the “Show or Fill Rule”, we may be able to generate an even higher time value return if selling the option. Now, your concern seems to relate to the stat for time value -0.98. I would check with the broker to see how this is calculated but it probably related to time value erosion from the day the trade was initiated to the current trading day. Thanks for sharing the positive impact my book has had on your investment success. the way I see it, you have made a very nice trade. now you look at the price of NSP @ 129.65 and you say WOW, and you want to decide if you should liquidate this position immediately, or wait until expiry 04/18/19 ? If you decide to wait until expiry, you can maybe make $490.00. $285.00 today = 2.4% on money invested or…. $490.00 later = 4% if all goes well, and NSP stays above 125.00 at expiry. Also, you may make a little nore than $285.00 if you are able to buy back the call at less than 6.70. We all get this type of dilemma many times, and each one must make his choice according to his or her gut. Purchased 100 shares alxn on 3/15 at 135.18; sold call expiring 4/18 strike 135 premium 5.11. Stock at 140.42 with two weeks left. Considering buying a 135 put for .4 to protect against drastic drop between now and expiration. Seems better than closing position now which yields about 133.5. Thoughts? (I think this is converting to a collar if thinking right). You are 100% correct. Adding a protective put is converting the covered call trade to a collar trade. Now, you are in great position now (currently) having maximized your trade with lots of downside protection down to the $135.00 strike (stock closed at $141.20 on Friday). The $135.00 put shows an ask price of $0.85 as of market close and the $135.00 call shows an ask price of $7.60 (we can probably do better by leveraging the “Show or Fill Rule”). Let’s use worst-case-scenario…$7.60. 1. Take no action and continue to monitor what is currently a very successful trade… a very reasonable approach. 2. Convert to a collar as you suggested at a cost of 0.6% based on initial investment… also a very reasonable approach. 3. Close the entire position (mid-contract unwind exit strategy) at a time value cost of 1%… a reasonable approach if we can generate >2% in the remaining 2 weeks of the contract in a new position…. possible. We have 3 excellent choices here with no right or wrong. Personally, I would favor taking no action and continuing to monitor. Alan- Thanks so much for your time and thorough answer. Much appreciated! I sold 2 April 18 185 HD calls for $658. The stock has sky rocketed to $202 per share. Would you buy back and roll out or out and up? Congratulations on a successful trade to date. I normally reserve rolling decisions closer to expiration Friday. Early exercise is unlikely especially if not associated with an ex-dividend date and there is a time value component to the premium. With HD trading at $202.06 and the $185.00 call showing an “ask” price of $17.45, the time value cost-to-close is $0.39 or 0.2%. The strategy I would look to is the “mid-contract unwind” exit strategy if closing the position meets your portfolio requirements (tax issues etc.). If keeping the stock is your goal, waiting until or close to expiration Friday for rolling options while monitoring our trades should be favored. 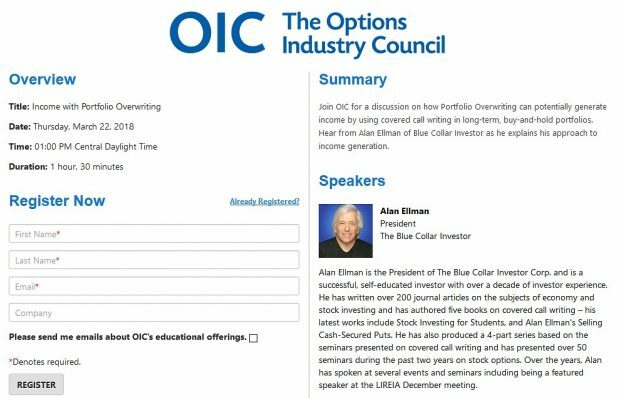 I was wondering if the BCI community utilizes option alerts to signal whether a trade can be unwinded before expiration Friday, because the option is in the money. Closing short calls can be automated to a certain extent Once a covered call option has sold, we can immediately enter a buy-to-close (BTC) limit order to buy back that option using the 20%/10% guidelines (or any other threshold deemed applicable). Let’s say we sell an option for $2.00. We can then enter a BTC limit order at $0.40 and change to $0.20 mid-contract as detailed in my books and DVDs. If the short call is closed, we can then decide what next-step action to take from our arsenal of exit strategy opportunities. If a strike is in-the-money as we approach 4 PM ET on expiration Friday, the option must be rolled if we want to retain the shares. Time must be set aside to accomplish this. If Friday is not possible, Wednesday or Thursday will work as well. If the strike is close to the stock price, the option should be rolled and not dependent on an alert because the final stock price is not determined until slightly after 4 PM ET. I clicked on your link above, brewed me a cup of hi-octane coffee and read a master at work. Excellent! Modern day conspiracy theorists, in my opinion, are almost always wrong. There was a time when stock price manipulation was rampant. (Everyone should read Edwin Lefevre’s book, “Reminiscences of a Stock Operator”). But today with all the regulations, massive amounts of mega data, every trade date and time stamped to the nano second and algorithms looking for everything it is virtually impossible to even attempt to manipulate the market. The “pinning the strike” is done by computers. No human is capable of the second by second analysis necessary. Nor can one type fast enough to enter the trades necessary. It seems to me the “machines” more and more create the major short term moves of the market. Both the mini crashes and the mini booms. Most people see the mini crashes but fail to see the mini booms. Many times we see the humans correcting the machines, usually before 11:00 am. The activity after 3:00 pm seems to be the machines doing their jobs and day traders closing their positions. One would think that this puts the individual investor at a distinct disadvantage and it does to a degree but much less than one would think. We don’t have machines trading for us, with the exception of “buy to close” limit orders. So we don’t have to correct our machines and we can avoid those hours when the humans are correcting their machines. Lastly, I believe humans and machines use pattern recognition to make decisions. We humans do this all the time without being aware of it. Our brains do it for us automatically. That’s how we make “intuitive” decisions. We do it consciously when we look at stock charts. We don’t even have to draw trend lines, ascending or descending wedges, head and shoulders or all the other patterns that charts exhibit. We have a choice. Pick our time to make a move or do nothing. Most often doing nothing is the best choice. Having the discipline to follow the plan will in the long run work out best. Well my coffee cup is empty. Thanks again for all you, the BCI team and the BCI community do to make us all better CEOs of our money. I guess I’ll have to start writing longer articles in case you want a 2nd cup. Thanks so much for your generous comments. It is always a delight to read your market analysis, insight and plain ‘ol horse sense :)! I have been less active with selling options in the low VIX environment. I have been buying spreads and sometimes straight calls or puts ITM in my IRA. I have been letting core holdings run skipping the over writing for now. That works until it doesn’t. I am looking at overwriting half of my positions soon as this market seems to be running out of gas. You have been smart to sit overwriting out I wish I had. It has been about a 50/50 situation and those are the odds I prefer. I sold 50 contracts on BAC, had to roll them up and bought to close when they fell to .10. E-trade has a dime buy back program where you can buy back short options at a dime or under with no commissions or fees. I hit that spot in a ten minute window today. I, too, have really been confused about this market. I will think it is definitely going down and I will buy some puts. (I am buying LEAPS puts with the intention of selling them within a year or less.) Then it surprisingly turns up with all the right technicals. I keep “knocking on wood”, my head usually, but I have had one of my best years this first quarter even with ending March down 1.71% for the month. January and February were that good. I am as nervous as an expectant father driving his wife to the hospital while she is in labor. I don’t know what to expect from this earnings season. I suspect, maybe hope, that most companies have talked down analyst expectations to the point where they can still beat them even though they will not be growing as they have in the past. I am not a conspiracy guy but I do believe in the herd mentality on wall street. There is usually a tendency for analysts to not go real negative until after there is a large downturn. They are almost all right with hindsight. I am spending much more time on my laptop trying get a feel. Barry tipped me off to the value of buying LEAPS as a stock replacement strategy some time ago. I have a few for Jan 2020 on CSCO, HD, BABA, DIS, BAC and BA. I figured that was a diversified little pile for my experiment. I have already sold a few of everything except the BAC and BA at more than a double to pay for the trade and make the rest risk free. I hope they run:)! BA was a gamble and I knew it. I bought it after the recent accident and 737 grounding figuring it was a news event and would rebound. I may have guessed wrong on that one :)? In my strategy, I have chosen to trade only companies that have weekly options available. I find this gives me more flexibility. For example, today is right in the middle of the month if I’m dealing with, say, GDOT. There are only 10 days left until the current month expiration, so I either would have to wait until April 22nd or 23rd to trade the next month, or perhaps enter now for the 17 MAY 19 expiration, which is a lengthy 39 days. However, if I choose BBY, I can enter the 10 MAY 19 expiration option which has 32 days left. Is my thinking correct, or no? I also have chosen to only trade companies with weeklies because I feel they get more movement to them since they are more popular. Like all investment strategies, the use of Weeklys has its pros and cons. As an example, Weeklys are a great product for navigating earnings and ex-dividend dates. A negative would be quadruple the number and amount of trading commissions. I believe that success can be achieved with both and, as you know, I favor Monthlys but a careful analysis of the pros and cons will guide us to the best choice based on our personal risk-tolerance and trading style. For a complete list of Weekly pros and cons, see pages 141 – 142 of The Complete Encyclopedia- Volume 2. How are you? I am writing you because something happens with a trade a placed on ETRADE. I did a sales put last week for BA at strike price 390 and the stock close on Friday at 391.93 on 04/05/2019 and I was assigned. Is there any explication about it? I will highly appreciate your input. Professionals have the opportunity to exercise options 90 minutes after market close. If news comes out shortly after market close that points to a substantial move in the stock one way or the other, those decisions can impact exercise in an unexpected way. Last Friday, Boeing announced a cutback in production as market trading closed. This was viewed a significant negative for share price an so your out-of-the-money put was viewed (correctly) as an in-the-money strike by the time the market opened on Monday. BA closed down $17 yesterday. Unexpected bad news is a risk of being in the stock market and even if this came out during market hours, the results would have been similar. This week’s Weekly Stock Screen And Watch List has been uploaded to The Blue Collar Investor premium member site and is available for download in the “Reports” section. Look for the report dated 04/05/19. The prices are as of the close today, o4/09/19. Thought I would share my experiences after E-filing my return with TT Home and Business. That was an experience being able to see the results from 2 brokers. This is my 3rd year with Alan’s BCI methodology and this time it was different. I did extensive research for the 1099-B data because of the issues discussed below. The research included, calling brokers and involving the tax team, the security hotline (investor relations), the security contact for their Schedule K-1, research online regarding Tax Straddles and Sec 1256 Contracts (Form 6781), history of offsetting positions and Congress’s attempt at correcting Tax inequities and the Tax Law. Of course, for future years, I will have the knowledge behind and will not have to re-invent the wheel! I would appreciate comments on what others have found with the above similar issues. I had problems with 3 Securities for the 2018 tax year, namely GSG, VNOM, OIH. Hopefully my information may help others in some way. What I traded: I bought this Security as it was the #1 ETF on the Run List. I closed my position 1 week later after reading the prospectus and realizing that I was going to received a Schedule K-1 for each trade, which may report losses despite my having gains in the trade (the prospectus warned!). I did report my concerns on the BCI Blog but received no comments on my comments about the prospectus. *3 version of Schedule K-1 from GSG. #1 Combined 2 Individual Accounts into one; #2 One for the IRA. #3 One for the Trust. All had ZERO amounts to report. They combined my 2 individual accounts into one, and for the Trust. I called GSB Investor relations and they explained to me my Schedule K=1 were zero since probably because there were not distributions during the time I owned the Underlying security. Question: Has any received K-1 with reportable items trading covered calls? **Fidelity: Classified it as BOX A (Basis reported) for my 3 option trades. Results: I believe that is an an error for Fidelity since GSG is a LP (limited Partnership) and files a Schedule K-1. Fidelity’s Schedule K tax team had a backlog so I filed the 1099B as reported since there were not tax issues (Zero to report). I will follow up with Fidelity later on this issue. **Etrade: Classified it as BOX B (Basis not reported and marked N/A in 1099B) Results: Since I received K-1 with Zero balance it did not affect my taxes other than adding the Cost Basis which was missing and marked N/A..
Not that this is a limited partnership so a Schedule K-1 would be expected. However after reading the Prospectus, effective May 10, 2018, the tax status of the Partnership for Tax returns changed to a standard 1099-DIV, NO Schedule K-1. My VNOM Trades occurred after May 10, 2018..
Fidelity then was correct in the 1099B. Etrade, after I called them, sent to my surprise a few days later a CORRECTED 1099B. Etrade – They indicated the Special section of the 1099b (Box 8-11) was correct. I research this and read the Tax Code and the history for Section1256 of the IRS (Tax Shelter Accounting Scams / Inequities of the 1970’s etc. to claim losses while retaining the underlying using offsetting positions). OIH is not a Limited partnership, but it does trade a Commodity. I did find a six – part article “n article (Website: Seeking Alpha) where it did mention in an article that commodity ETF’s may be classified as Section 1256 of the tax code. It also mentioned that tax experts / accountants differ on this issue and also in some cases classify an ITM (in the money) call option as a Section 1256 Offsetting position. For my tax return, I filed for Etrade, Form 6781 for the the 2 call options ($309.00) , which reports the gain I had as 40% short term and 60% long term. ← Should We Add a Short Put to Our Collar Trades?